Mubychem Group, established in 1976, is the pioneer manufacturer of Sodium Metabisulfite, Pharmaceutical, Fragrance & Flavor chemicals in India. Mubychem Group has several manufacturing facilities spread across Gujarat and Mumbai India and world wide contacts and toll manufacturers. We are exporting globally to countries like USA, Europe, UAE, South Africa, Tanzania, Kenya, Egypt, Nigeria, Uganda, Turkey, Mexico, Brazil, Chile, Argentina, Dubai, Indonesia etc. Sodium metabisulphite also called sodium disulphite. Freely soluble in water, slightly soluble in ethanol (96 per cent). A. pH 3.5 to 5.0 for solution S.
B. To 0.4 ml of iodinated potassium iodide solution R add 8 ml of distilled water R and 1 ml of solution S diluted 1 to 10 in distilled water R. The solution is colourless and gives reaction of sulphate. C. Solution S gives reaction of sodium. Dissolve 5.0 g in carbon dioxide-free water prepared from distilled water and dilute to 100 ml with the same solvent. 3.5 to 5.0 for solution S.
To 5 ml of solution S add 5 ml of dilute hydrochloric acid R. The solution remains clear for at least 15 min. 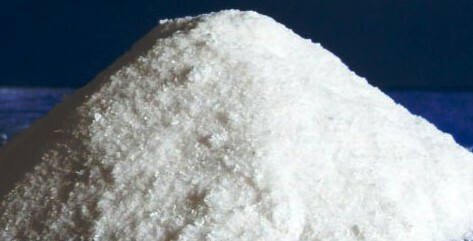 Maximum 20 ppm, determined on solution S.
Sodium Metabisulfite contains an amount of Na2S2O5 equivalent to not less than 65.0 percent and not more than 67.4 percent of SO2. Packaging and storage— Preserve in well-filled, tight containers, and avoid exposure to excessive heat. Identification— A solution (1 in 20) responds to the tests for Sodium 191 and for Sulfite. Limit of chloride— Dissolve 1.0 g in 10 mL of water, filter, if necessary, through a small chloride free filter, and add 6 mL of 30 percent hydrogen peroxide. Add 1 N sodium hydroxide until the solution is slightly alkaline to phenolphthalein, dilute with water to 100 mL, and mix. Dilute 2.0 mL of this solution with water to 20 mL, and add 1 mL of nitric acid and 1 mL of silver nitrate TS. Mix, allow to stand for 5 minutes protected from direct sunlight, and compare the turbidity, if any, with that produced from a 2-mL aliquot of a control (prepared by diluting 0.71 mL of 0.020 N hydrochloric acid to 100 mL) in an equal volume of total solution containing the quantities of reagents used in the test : any turbidity produced by the test specimen does not exceed that of the control preparation (0.05%). Iron—: the limit is 0.002%. Limit of thiosulfate— Mix 2.2 g with 10 mL of 1 N hydrochloric acid in a 50-mL beaker. Boil gently for 5 minutes, cool, and transfer to a small test tube. Any turbidity is not greater than that produced by 0.10 mL of 0.10 N sodium thiosulfate, similarly treated (0.05%). Sodium Metabisulfite occurs as colorless crystals or as a white to yellow, crystalline powder. It is freely soluble in water and slightly soluble in alcohol. Its solutions are acid to litmus. Identification: A 1:10 aqueous solution gives positive tests for Sodium and for Sulfite. Assay: Not less than 90.0% and not more than 100.5% of Na2S2O5. Iron: Not more than 10 mg/kg. Selenium: Not more than 5 mg/kg.